A 30-day trial version of Synopsis 2.0 is available for free. The version runs on Microsoft Windows Vista/XP/2000/2003/98. The download includes the Synopsis application with a library of various software components that you can use to visually assemble programs. Also included are example programs to help you quickly learn how to use Synopsis. Note: Synopsis requires Microsoft .NET Framework 1.1 or higher to be installed on your computer. You can obtain the .NET Framework 1.1 from the Microsoft .NET 1.1 download site. You can obtain the .NET Framework 2.0 from the Microsoft .NET 2.0 download site. If you are sure that .NET Framework is already installed on your computer then you can skip this step. Verify that you have all the required updates for the Microsoft .NET Framework and any critical updates for your operating system. You can check for required updates at the Microsoft update site. Several Synopsis components depend on Microsoft's DirectX 9.0c. If you do not have DirectX 9.0c installed on your machine or are not sure, you can download it at the Microsoft DirectX download site. Click the Download button that appears at the top of this page. Click Open to start the installation or click Save to save the installation file on your hard disk. If you save the installation file, you can invoke it to start the installation. After you install Synopsis, visit the SCPs page to browse and download extra software components. SCPs can contain a variety of software components which you can dynamically load into Synopsis to enhance the programs that you develop. 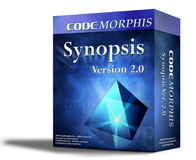 If you have any questions or comments regarding this download or our products, please contact us at support@codemorphis.com or visit our forums.